"I knew I shouldn't have worn pink today!" Robin Soderling’s stunning upset of Rafael Nadal at the French Open left many critics puzzled (“Wait, wait, wait. Who’s Robin Soderling?”). Nobody had ever seen Nadal (previously undefeated at the French Open) pushed around on clay with such consistency before. Experts struggled to come up with valid reasons explaining how this ever could have occurred. What did Soderling do so differently from everybody else? Soderling, didn’t do anything different. Nadal on the other hand changed a lot… And he’s not the only one. Read on to see what other athletes made the mistake of wearing pink and thinking they could get away with it. 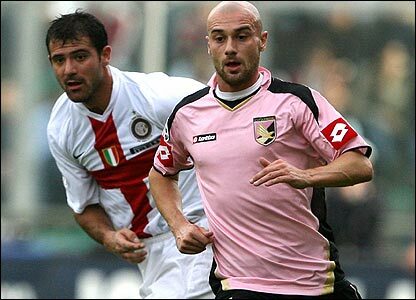 Leave it up to the Italians to wear a pink kit. Typical. They thought they could get away with it, but were punished in 2006 when they were found guilty of match-fixing. The team were stripped of their 2005 and 2006 titles, banned from the Champions League for a year and relegated to Serie B. Did Juve really think they were going to go unpunished for this monstrosity? I’m not quite sure who came up with this idea, or why any self-respecting player would wear these. I wonder how much money they were paid. I think a few players wore the boot on its release day but after that, not so much. However, Nicklas Bendtner has been known to sport them from time to time. That should say enough. Although, I have to admit that the promotion video is quite good. Martin O’Neil’s reaction is priceless (“Are people going to wear that?”). Well, that’s all I can think of at the moment. Feel free to add to the list. This entry was posted on Sunday, June 7th, 2009 at 9:23 am and is filed under Footy, Misc, Tennis. You can follow any responses to this entry through the RSS 2.0 feed. You can leave a response, or trackback from your own site. alright, i think it’s pretty much already been established, that despite nadal’s extremely good talent at playing tennis, he is a total fag. you look back through the past 5 years or so and every match he plays, he seems to be wearing something that screams homosexual. so the mere fact that this finally caught up to him and he lost as a result of his obscenely gay fashion is no real surprise. i hope you will agree that it is long overdue that he has finally lost a match, and that somebody has associated that with his overtly gay attire.